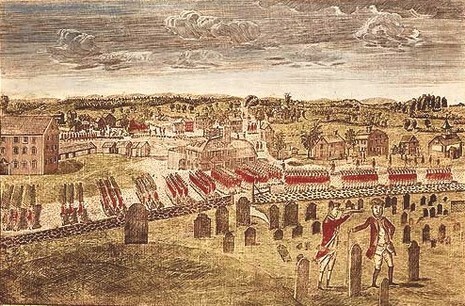 The Royalton Raid was a British-led Indian raid in 1780 against various towns along the White River Valley, Vermont, and was part of the American Revolutionary War. It was the last major Indian raid in New England. In the early morning hours of October 16, 1780, Lieutenant Houghton of the British Army's 53rd Regiment of Foot and a single Grenadier, along with 300 Mohawk warriors from the Kahnawake Reserve in Quebec, Canada, attacked and burned the towns of Royalton, Sharon and Tunbridge along the White River in eastern Vermont. This raid was launched in conjunction with other raids led by Major Christopher Carleton of the 29th Regiment of Foot along the shores of Lake Champlain and Lake George and Sir John Johnson of the King's Royal Regiment of New York in the Mohawk River valley, to attempt to drive the Americans out of the frontier areas and to burn anything of military value that might be used by the Continental Army if they decided to attack Montreal or Quebec City again. Four American settlers were killed and twenty six were taken prisoner to Canada. 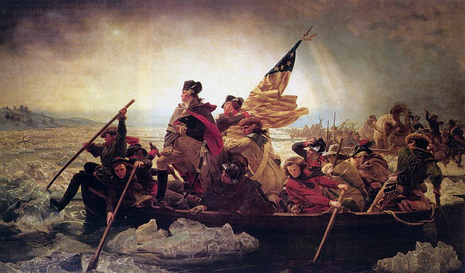 By the time the local militia could assemble, Houghton and his command were already on their way back north to Canada. The militia caught up with the raiders near Randolph, Vermont, and a few volleys were fired back and forth, but when Houghton said that the remaining captives might be killed by the Mohawks if fighting continued, the local militia let the raiders slip away. The Hannah Handy monument, on the South Royalton town green, is a granite arch honoring a young mother who lost her young son in the raid, crossed the river, and successfully begged for the return of several children.